Anyone trying to follow the situation in North Korea the past few months might be feeling the pangs of whiplash. Today, these two headlines existed on a single webpage hosted by www.foxnews.com. 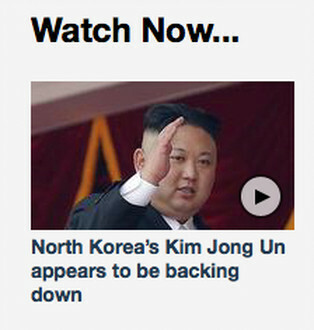 From this news feed it appears North Korea has managed to back down and level new threats in the same moment. The article on the left cites North Korea's state-sanctioned television station, KCNA, making "new threats" against the United States. That article, along with nearly every other account published in U.S. media, uses a parsed quote that includes the words "heaps of ashes". 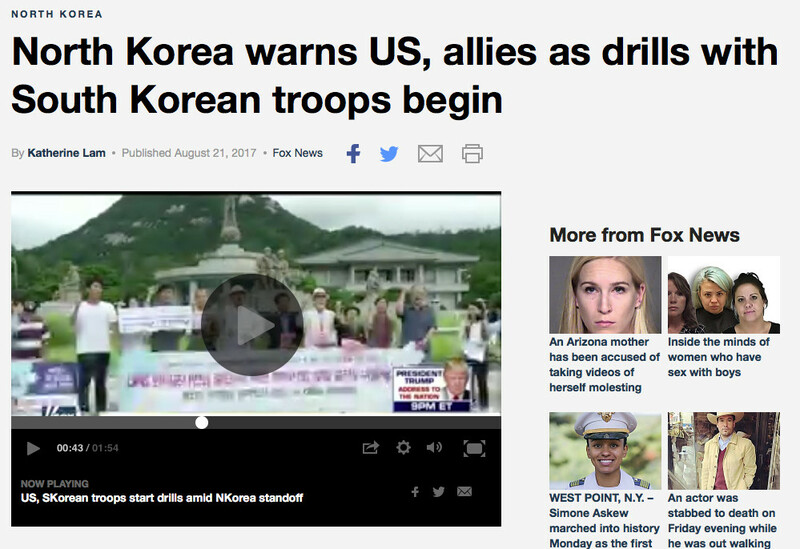 The video at right is from August 15, and features a military analyst who touts the "de-escalation of threats to bomb Guam," crediting the Trump administration's tactful maneuvering with China. "Kim the intimidator has been intimidated by an administration that finally has its message problem solved," Gordon Chang, author of "Nuclear Showdown: North Korea Takes On The World," told Fox Business Host Stuart Varney. But has there been a change of policy in North Korea? Was there ever an escalation or de-escalation, fueled by President Trump's administration or otherwise? This cycle of perceived threats and de-escalation originated and persisted long before DPRK Dictator Kim Jong Un was in power, and long before North Korea had any credible nuclear arsenal, and its fed by a repeated misinterpretation -- or omission -- of North Korea's state communications. "I think the biggest crucial thing that we keep missing is that North Korea's threats are almost always couched in defensive terms," University of California Korean Studies Institute Director David Kangtold WNYC's On The Media earlier this year. "It’s not, we will attack you, out of the blue. It’s, if you attack us first, we will take you down with us. And they’re pretty consistent. They say it pretty clearly. And the media tend to overlook that first part of the commentary from North Korea." Six months after that episode of On The Media, titled "Should We Be Worried About North Korea, Or Not?" the situation appears unchanged. If there was no escalation of threat in the first place, meaning that Korea was simply spouting the same public outcries we're used to. For one, North Korea has, with periods of hiatus, continued to develop nuclear weapons technologysince at least the 1980s. It should be no surprise to any observers that the nation continues to test missiles with increased range. Videos and cartoons depicting North Korean attacks on U.S. cities have been household staples in North Korea basically since the Korean Conflict. And North Korea has touted its capability of destroying the United States for just as long. This is nothing unusual for the Korean state media, which has spouted cautionary warnings in bellicose fashion for decades. Yet newsrooms in the west still gorge on an opportunity to turn an ambling Pyongyang news release into the latest national security threat. It appeared Tuesday evening that Secretary of State Rex Tillerson had also got looped into the cycle. The secretary held a news conference praising Kim Jong-un for restraint. Hours later, Kim appeared in state photographs touring a missile factory. "Every American president who has talked about striking North Korea has to ask themselves the question, will they respond. And every American president has to come to the answer, 'yes, they will,'" Kang said one month after the previous quote, when WNYC again asked whether or not the United States citizenry should worry about an attack by North Korea. And for this reason, the relationship between the United States and The North remains a fairly predictable and stable war of words. Unfortunately, for those relying on breaking news wires and cable news sources (ahem, Mr. President) to provide reliable truth and context, the situation seems desperately out of hand. This rift in perception and reality affords rife opportunity for distraction and political chest-puffing.